Some new Street Art to report in Belfast, my first such blog this year, having previously reported on Street Art in Manchester and Sheffield. As the title of this blog suggests, it’s in the East of the city, as you turn left after entering CS Lewis Square and head towards Dee Street. It is of a bird on one side, and then a colourful piece along the other side, done by Irony, Artista, Friz and KVLR, in association with Eastside Partnership. You can see a before and after here. In recent years, the wallspace in East Belfast has been brightened up by Hit The East (unknown if this will take place in 2019) and a mural in Tower Street. You may remember last May, Wardrobe Jam in East Belfast. It’s unknown if it will be returning, hope so. There will be Street Art hopefully appearing on here over the next few weeks. I’m intending to go to an event at the end of April in Island Arts Centre with some live pieces being painted. Meanwhile, Hit The North 2019 is going to be four months earlier than scheduled, taking place over the May Bank Holiday Weekend as part of Cathedral Quarter Arts Festival. I’ll be heading along to that, and then there’ll be a trip to Old Trafford later in May, which will mean a detour to the Northern Quarter. Yes, yes, I know, Pomona Wharf. There’s a big walkway from Salford Quays to Cornbrook Metrolink Station, and it’s covered with Street Art. You can usually see it from afar when you travel to and from Manchester City Centre on the Eccles/Media City Line. As it had only been two months since my last visit, there wasn’t a lot of new pieces to cover. Again, as I said in my last visit, the area could do with a clean up, and Street Art can play a part in it. It has been twenty-five and a half years since my first visit to Old Trafford and over those years, I’ve started to use those trips to explore Manchester and Greater Manchester more in recent years. Going Tuesday to Thursday for a midweek game, if the game was on a Tuesday night, it would mean i’d have a free day on the Wednesday. As the game I was going to was confirmed as a Tuesday night, I planned to go somewhere for a day trip on the Wednesday. I had three options – Hadfield (The League Of Gentlemen is filmed there), York or Sheffield. I decided to go with Sheffield as it was only 45 minutes away and my train tickets cost £10.60. It wasn’t intentional, but taking in a day trip to Sheffield when i’m in England for a football match, what day do I go to Sheffield? On a Wednesday, of course. 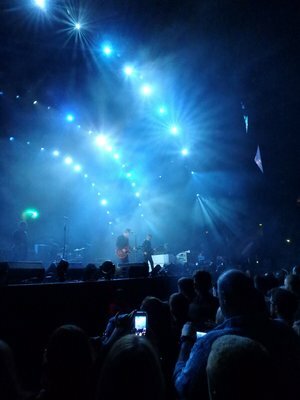 I had been to Sheffield before, spending a day there as part of a mini tour of the North of England in April 2010, taking in a James concert. My trip to Sheffield wasn’t with the intention of spotting Street Art, but it would have been rude not to. Despite being less than an hour away from snowy Manchester, it was sunshine and daylight in Sheffield, which made it easier for taking photos. I explored a lot of the city (Over 40,000 steps if you care about that type of thing), my favourite places were Sheffield Winter Gardens, Devonshire Quarter and The Moor. There is a free guide book produced by Sheffield BID (offices right beside Winter Gardens) of independent shops and businesses in Sheffield, and it has a feature on the Street Art in Sheffield, most notably by Pete McKee, whose Penguin mural in the Northern Quarter in Manchester has previously featured on this blog. 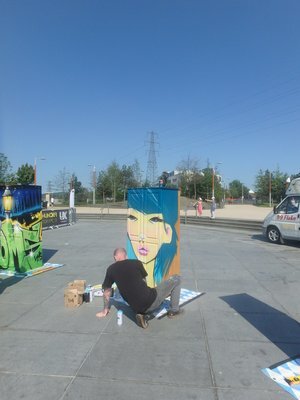 There is also a website called Street Art Sheffield, which obviously covers Street Art in Sheffield. Believe it or not, my trip to Sheffield came when I was in an internet blackout. I had no data on my phone and my Apple account was locked meaning I couldn’t access my ipad. It was strange, having no internet access whatsoever was both wonderful and horrific. It meant that I couldn’t cheat and refer to the website, meaning I was blindly exploring Sheffield’s Street Art. If I had another day, I might have used this website and made a plan of attack to see more pieces that I missed. I would definitely recommend Sheffield for a visit. Even if you get bored, you’re less than an hour away from Nottingham and Manchester. Not that you would get bored. My first photo adventure of July came on the weekend of the Quarter-Finals of the World Cup. 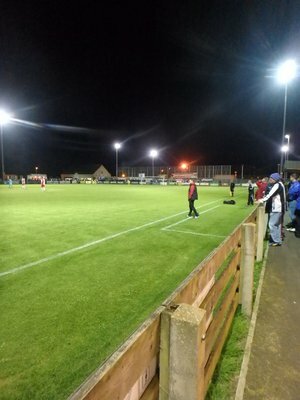 Unfortunately, it wasn’t in Russia, it was closer to home, at Wilgar Park as Linfield began their pre-season preparations. 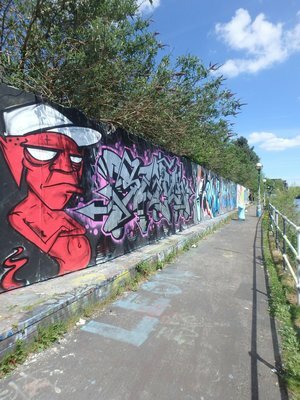 The following weekend, I headed to Dublin over the July Holiday, got some Street Art Photos, and went to see Shelbourne take on Drogheda United. 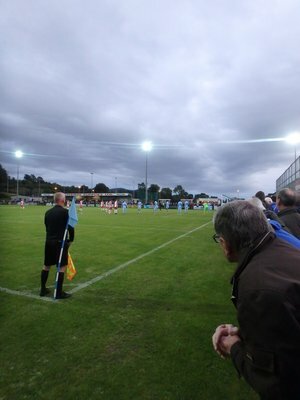 The month ended with two more pre-season friendlies for Linfield, away to Knockbreda and PSNI.